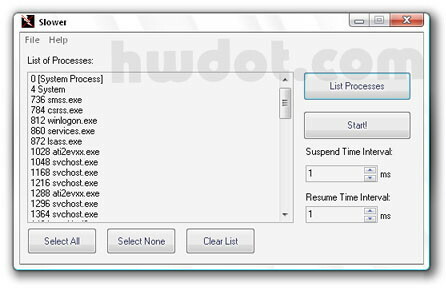 Slower Freeware: How to Slow Down Applications, Softwares, Programs, Cheating Games. ...wHat?!! Maybe you're confused with the function of this freeware. While so many programs/applications are built to speed up and make the process faster, this utility software just wants to slow down, make it slower?? 'Slower Freeware' ? : Yeah, this program was originally created as a cheat to slow games down in hard levels. By slowing down the process, it's easier for a player to predict & anticipate his opponent's movement. Now, you can use it for other purposes: any programs or applications. Slower is a program that slows down other programs of your choice. You set a delay and it will periodically pause and unpause the selected programs according to the stated delay. This application has a simple interface. You'll just select a process list and set a delay. By clicking "Start", the application you've already chosen will be slower. Slower version 1.1.4.7 offers two different delay times. One for the amount of time to suspend the programs (suspend interval) and the other, the amount of time to allow the program to run (resume interval). Slower then starts suspending and then resuming the selected programs in a cycle. + Grab Slower 1.1.4 via download.com here. ...wanna make it fast, faster, rocket quickly, etc ??? ;) For 'Online' you might be interested in tweaking internet speed, and 'Offline' you may want to tweak Windows. You can learn more about how-tos on this blog. 3 comments on "How to Slow Down Applications, Softwares, Programs, Cheating Games"
Well, this certainly is an interesting device. Just to clarify it's use, the first box is a delay. The second is an allowance. BOTH are constantly operating. If your Suspend is 0 and your resume is 1000, then the game will run at normal speed. MS stands for milliseconds. So a game that has a suspend of 10 and a resume of 240 will run for 240 ms and then pause for 10 ms, then resume for 240 ms, back and forth constantly. I found my average speed vista ran games at ½ speed when the suspend was 50ms and the resume was 50ms. My WIN7, which was much faster had a suspend of 50 and a resume of 35 to get the same result. You'll have to play with those numbers to get what you want consistantly. Hope this helps!